Poutine lovers, heads up! This French-Canadian classic, with a Mediterranean twist, will have your mouth wondering where this combination has been all your life. The homemade oven fries are so simple to make, and the rest comes together in mere minutes! 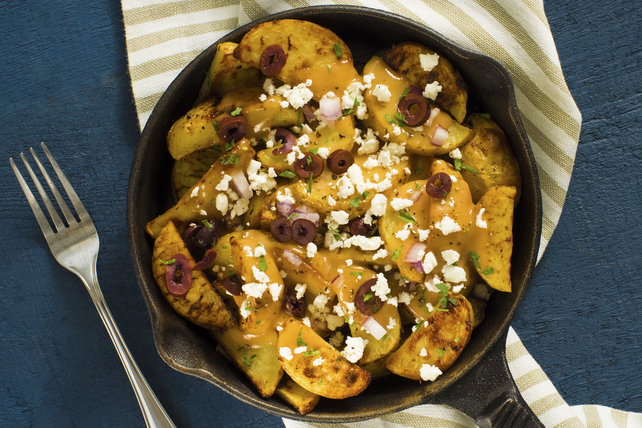 A velvety chicken gravy, crumbled feta, olives and other delicious Mediterranean flavours add freshness and a flavour twist to a classic poutine. Cover rimmed baking sheet with foil; spray with cooking spray. Cut potatoes into 1/2-inch-thick lengthwise wedges; place in large bowl. Add dressing; mix lightly. Bake 35 min. or until potatoes are tender and golden brown, turning after 20 min. About 10 min. before potatoes are done, bring gravy, ketchup and dry seasonings to boil in saucepan, stirring frequently. Simmer on medium-low heat 5 min., stirring occasionally. Substitute 1/4 lb. (115 g) Cracker Barrel Mozzarella Cheese, cut into 1/4-inch cubes, for the crumbled feta cheese.